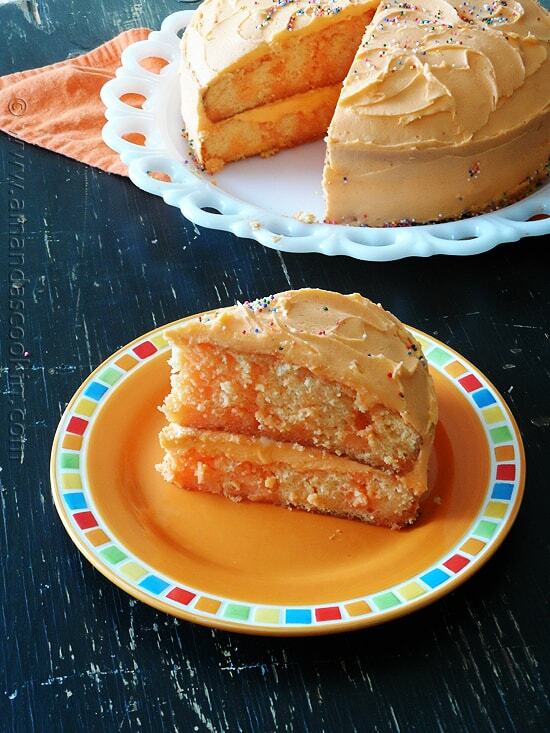 Orange flavored cake, orange gelatin and orange buttercream. A triple treat for any orange lover like me! 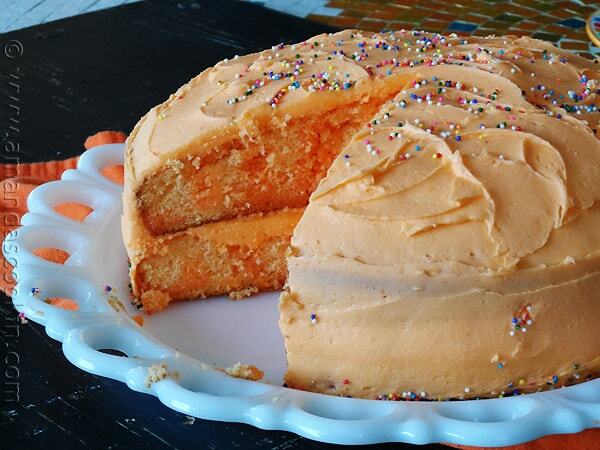 The convenience of a cake mix, the nostalgia of Jell-O and buttercream made from scratch. It’s the best of all three worlds. I have always loved the taste of orange anything. When I was a kid, I never really like Pepsi or Coke. Whenever we were allowed to have pop (or soda, whatever you prefer) I always ordered orange. As a teenager I acquired a taste for root beer and 7-Up, but orange soda was always right up there for me. When it came to ice cream bars, orange Creamsicles were my dessert of choice. And, yes I like orange sherbet, but not by itself. There has to be some vanilla ice cream with it. It’s like a Creamsicle in a bowl! Then of course, at holiday time I always manage to find myself with one of those chocolate spheres, flavored with orange and cut into wedges, just like the fruit. Those are amazing! So, yes, I’m an orange fanatic. I’ve made quite a few different orange flavored desserts. 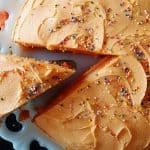 You’ll find links to those recipes at the end of this post. But, for now, I’m going to share a triple dream for all you orange lovers out there. 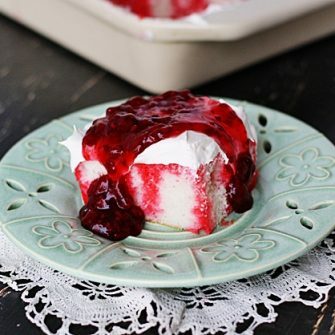 Anyone who has ever enjoyed poke cake knows that the combination of Jell-O and cake is truly a match made in baker’s heaven. 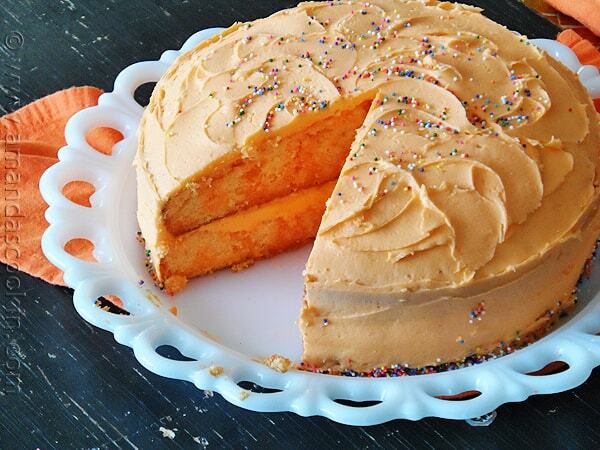 Make the flavor of that Jell-O, the cake and the frosting all orange and you have an orange lover’s dream cake. I promise. You’ll love it. I did. Preheat oven to 350 F. Prepare cake mix according to directions the box. 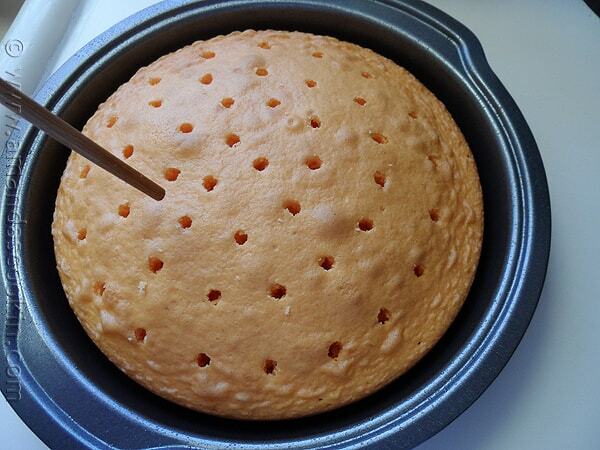 Bake cake in two round cake pans. Allow to cool in pan on wire racks. DO not remove the cakes from the pans. Use a wooden skewer to poke holes in each cake round, about 1-inch apart. Prepare gelatin as directed on box with water. 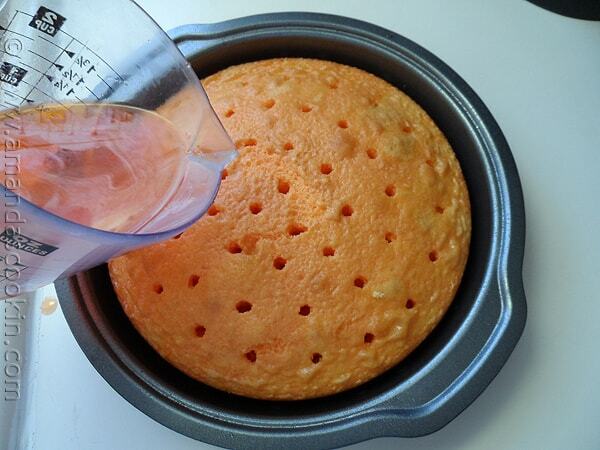 Pour half of the liquid gelatin mixture over one of the cake layers, pouring it all over to cover the holes. Repeat with the other half of the gelatin mixture and other cake layer. Refrigerate cakes for at least 2 hours. Prepare the buttercream by beating the cream cheese and butter together in a large mixing bowl until creamy. Beat in orange extract. Reduce speed to low and add in one cup of powdered sugar at a time, beating until incorporated. Add the food coloring and beat on medium until frosting is smooth and fluffy. Place one cake layer onto a cake plate and spread 1/4 of the butter cream on top to about 1/2-inch from the edge. Place second cake layer on top and press down gently. Frost sides and top of cake with remaining frosting. Keep cake refrigerated until serving. So much FUN!! I want a slice. Or two! Thanks Brenda, it was definitely delish! 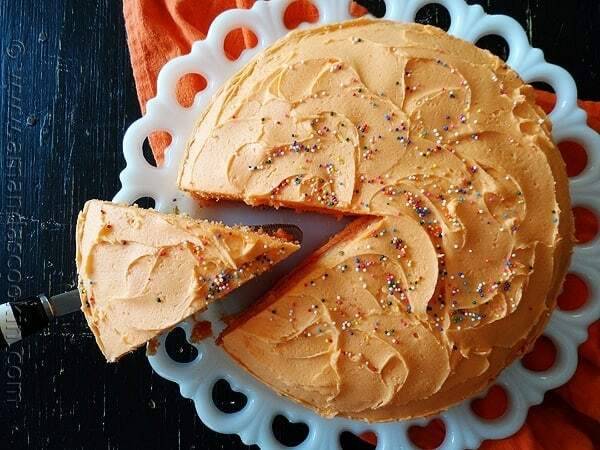 My favorite cake has always been orange, also. It’s the one I always requested Mom make for my birthday. 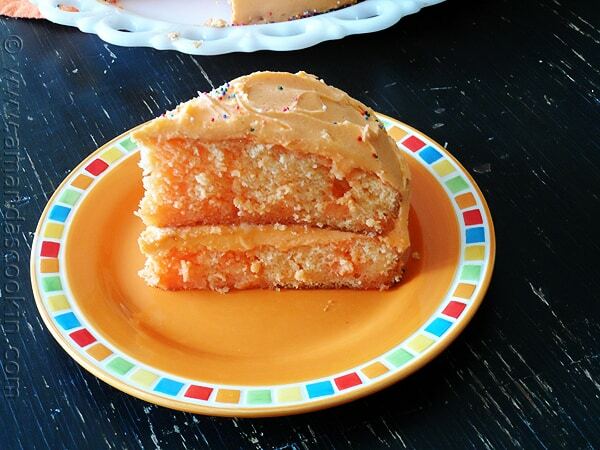 Of course she didn’t put orange food coloring in the frosting back then, but I do remember orange zest in it. This sounds yummy. do you remember I wrote how to start a newsletter. It didn’t work out. Know I am submitting my recipes to 3 recipes sites. This keeps me busy and my name gets around. Thanks for everything. Also I might be writing a small cookbook in the near future. Good luck with your cookbook! Oh. My. Yum! I love orange, too. Almost any kind of way it comes. This cake literally has my mouth watering right now.